Pick “Skip to the Lake” where you can Relax, Refresh, & Rejuvenate. 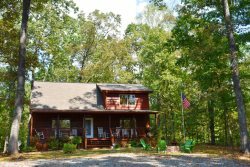 This home is nestled in the trees above Lake Blue Ridge just a short walk to swimming, boat ramp and hiking trails. Lake Blue Ridge Marina, downtown Blue Ridge and the Aska Adventure Area are less than 10 minutes from your cabin making this is the perfect location for a family retreat. Outside you will find a hammock for a cat nap, a horseshoe pit for some friendly competition and an outdoor fire-pit for roasting wieners or sharing s’mores with the kiddos. There is a gas grill for cooking those trout you catch on the Toccoa River. The home is secluded and offers a screened porch to keep the pesky bugs away. Walk into the main level of the home to a fully equipped kitchen, dining area, living room and a beautiful stone, gas log fireplace. The vaulted wood ceilings gives this home that cabin feel you are looking for. From the main living area you can access the back porch where you’ll find plenty of seating and a Hot Tub for some relaxation. A master bedroom w/ king bed also has access to the Hot Tub area. A full bathroom completes the main level. As you walk down the steps to the lower level you will see a one of a kind, beautiful hand painted mural. The lower level has a bedroom with queen bunk beds and a bedroom with a queen bed, a daybed with trundle plus a full bathroom making this home comfortably accommodate 10 guests. This GREAT location, close enough to town for those who want to visit the local antique shops and events happening in the area. The outdoor activities are endless in the north Georgia mountains where Boating on Lake Blue Ridge, Hiking, Kayaking, Tubing, White Water Rafting, Paddle Boarding, Horseback Riding, and Zip-lining are all right at your fingertips. You can also visit the Waterfalls, Hike to a Swinging Bridge, or take a more relaxed approach and enjoy a great meal at one of the many wonderful restaurants located in the area. Don’t forget to take a ride on the Blue Ridge Scenic Railway, be entertained at the Big Foot Museum or step back in time at the local Swan Drive-in Theatre. And of course Mercier Orchards is a must. There is something for everyone in the mountains! Beautiful cabin in a wonderful location! Check-in/out was effortless and everything was just as we expected! We loved this place, but it should be noted that there is no Wi-Fi. To be fair to the owner, it is clearly not listed an amenity; however, we feel it should be considered in the description of the property. Wi-Fi is a minimum expectation for todays travelers. It was nice to be completely unplugged from the grid, but it would have been nice to be better prepared given that there is virtually no cell phone signal at this property regardless of your carrier. Additionally, there was about a 15 difference in the upstairs and downstairs temperatures; however, when we reported this to the leasing company, they were very, very quick about getting space heaters out to us that took care of the issue. The home was very well appointed and had just about everything that we needed. The leasing company was very responsive to our any issue.Our kids loved it, and we will consider it again for a future vacation. Beautiful wooded area with new cabin. walking distance to lake. Perfect weekend retreat. The cabin was in a perfect location, very clean and had everything we needed. The check in and check out process couldnt have been easier. Would highly recommened this cabin! !